The college contribution credit a taxpayer may claim on the Montana College Contribution Credit (Form CC) is calculated based on the amount of charitable contribution made by the taxpayer to the foundation or general endowment fund of a college or university located in Montana. Under the Tax Cut and Jobs Act, charitable deductions are not allowed for payments made to institutions of higher education when the taxpayer receives in return the right to purchase tickets for athletic events at the institution either directly or indirectly. Other deductible charitable contributions made to a college located in Montana still qualify for the credit. However, if you take the credit for Montana tax purposes, you must reduce your charitable contribution by the corresponding amount. The federal Tax Cuts and Jobs Act suspended all miscellaneous deductions referenced under IRC 67, for the tax years 2018 through 2025. Miscellaneous itemized deductions are those deductions that would have been subject to the two percent of adjusted gross income limitation. These deductions are also suspended for Montana income tax purposes. Deductions for the repayment of under a claim of right amounts such as Social Security benefits. 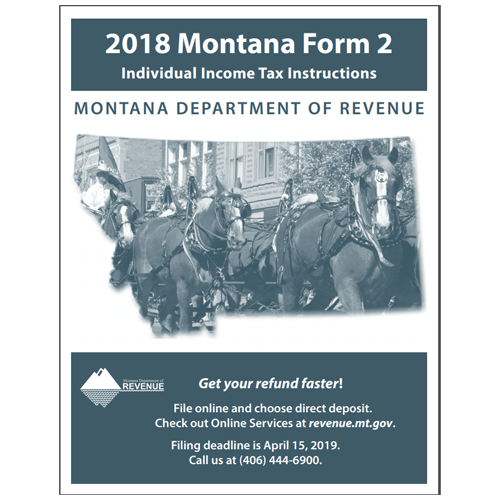 Casualty and theft losses of income-producing property and gambling losses, which are also deductible on federal Form 1040, Schedule A, line 16, are deductible on lines 15 and 17 respectively on the Montana Itemized Deductions Schedule. On December 31, 2018, the Servicemembers Civil Relief Act was amended so that a taxpayer moving to a state to be with their spouse who is a military servicemember may choose to use the tax residence of the military spouse. Previously, when a taxpayer was not a resident of the state where his or her spouse was a resident for tax purposes, the Act did not provide protection against gaining tax residency in the state where the taxpayer moved to in order to be with their spouse. A servicemember’s spouse can now elect to be protected by the Act by choosing the tax residency of the servicemember when filing their state income tax return. The Act also exempts spouses who are not residents of Montana for tax purposes from paying income tax on the wages they earn in the state. The protection does not apply to a spouse that is already a resident of Montana or who elects to be a resident of Montana.